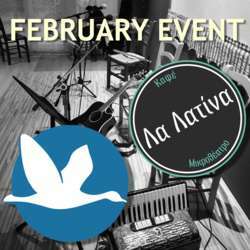 Thessaloniki InterNations February Event "LA LATINA"
FUN IS COMING! Let’s meet for the monthly get-together in the center of Thessaloniki! Let’s have some drinks and tasty Spanish tapas with sangría, Spanish beer and wine in the nice and warm atmosphere of the Spanish Theater-Bar "LA LATINA". Join us and get the chance to make new friends and expand your network! Come and get to know your fellow InterNations members, enjoy the most delicious authentic Spanish flavors and Spanish music in town, chat and mingle, make new friends and have a great time! - The price list of drinks is in the photo section of this publication. - Each member must pay their own consumption. - At the end of the event, there will be a surprise for the Albatross Members. - At 23:30 there is a Jam Session scheduled for those who want to stay at the venue. Kindly confirm your presence by clicking the Attend button. Please forward the invitation to your expat friends in Thessaloniki and bring them along! If you have registered, but then are not able to attend, please take the time to unregister! This is really important to us, as we need accurate numbers for planning, thank you! Feel free to bring your international friends but please invite them to join InterNations first and let us grow!